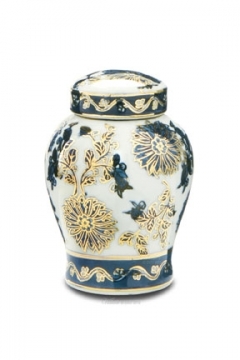 Hand-made and -painted porcelain The white porcelain body of the Antique English memento urn is created by a skilled artisan on a pottery wheel. The gold and blue design is then hand-painted, the color is fired onto the surface, and gold enamel is applied on top. A final polish perfects the design.